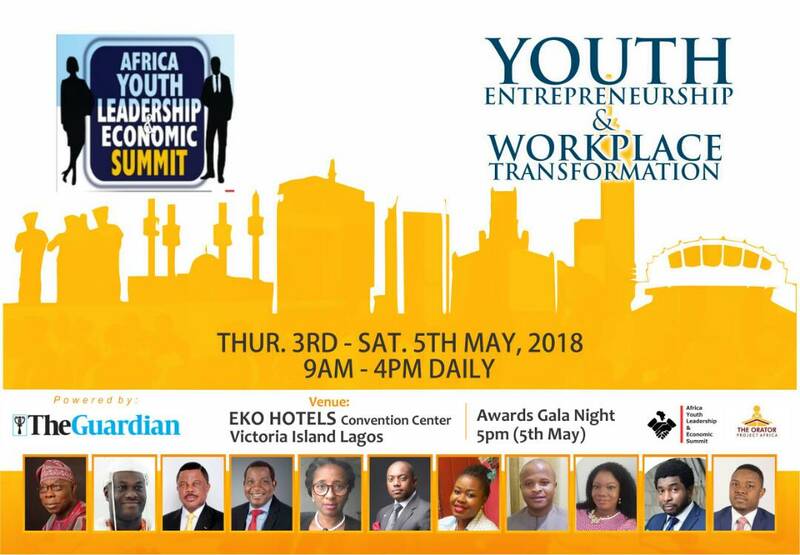 The AFRICA YOUTH LEADERSHIP & ECONOMIC SUMMIT 2018 slated for 3rd - 5th of May is set to hold at the prestigious Eko Convention Center, Eko Hotel & Suites. * Entrepreneurship play an important role in the existence and functioning of states as they present an opportunity for young people to contribute to the socio-economic development of any country through innovation. Entrepreneurs are the driving force that keeps our economy rolling. But the life of an Entrepreneur is not that rosy. They have to take an insane amount of risk, swim against the tide and have to come up with new ideas to emerge as successful entrepreneurs. As evident, managing all these different activities simultaneously is immensely tough. Just like any other human beings, Entrepreneurs are also in need of some assistance so that they can do their job in an efficient way. Thanks to the massive advancement in the field of technology in the past few decades, lives of the entrepreneurs have become much easier. The main Goal of the summit is to create a space that bring different stakeholders to deliberate and charter an effective course of action of entrepreneurship and actors across the continent on strategies to uphold and strengthen entrepreneurship values through technology in consonant with the united nations Sustainable Development Goals (2015-2030) Goal 8 (Decent Work and Economic Growth ) and Agenda 2063 of the African Union. Our Delegates (5000) cut across Civil Society/Non Governmental organizations. Technical Partner, Line Ministries (The Ministries responsible for Employment, Education, Information);The National Youth Council; Representative(s) of Youth NGOs; Relevant Statutory Bodies; Representatives of the Federal, State, local, Governments; Member(s) of National Assembly/(Senate/House of Representatives);State Assembly; Representative(s) of Donor/Sponsor/Partner Agencies/Organizations; Representatives of Cultural Institutions; Representatives of the Private sector; Media Organisations, etc. in Africa. At past Conferences and Summits, delegates were joined by a line of distinguished facilitators that included Dr Usman Kabir, DG CMD, Dr Larry Jones Chairman Africa Youth Chamber of Commerce & Investment, Dr Sunday Popoola, Lecturer Imperial College London and many more others. 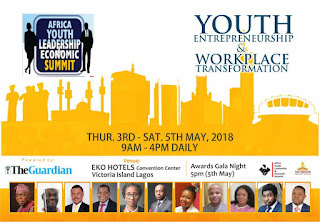 This year’s AFRICA YOUTH LEADERSHIP & ECONOMIC SUMMIT 2018 will bring together about 4,000 participants from different sectors which includes: Corporate organisations, Entrepreneurs, National Youth Council Of Nigeria, Africa Youth Chamber of Commerce & Investment, NYSC, Universities, Polytechnics, Religious bodies etc, with the aim of training and equipping them with the right skills needed to do well in their careers or businesses, 20 youths with unique business ideas will be empowered with prize money ranging from #200,000 to #500,000 to start their businesses. These individuals will be trained by Africa Youth Chamber of Commerce and Investment on train to gain approach for Business success, this is to ensure optimum utilization of funds. At the end of this 3 days program divided into conferences, exhibitions, workshops, breakout sessions delegates will become more heavily involved in their communities as the journey will lead them hopefully to a network of nearly 4,000 change makers around Africa who they can collaborate with for productive purposes and the development of our economies.